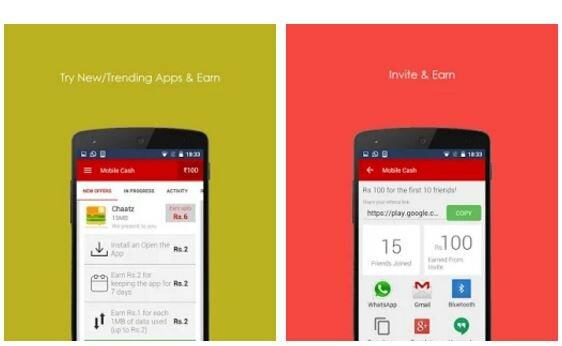 Hi friends, today we are introducing a new free recharge giving android app called Mobile cash. Mobile cash is new in this category and they offers more good offers. the one thing that i fell positive thing in mobile cash is they are providing free rs 1 every day. that is you can earn RS 1 every day without doing any works. Means within 10 days you can earn Rs 10 free recharge without doing any tasks. Which is a fantastic offer from mobile cash. Also their referrer credits are also more than compared to other apps in this category. Mobile cash giving RS 5 for refer person registration + RS 15 when the referred person installs 3apps. That is you will get Rs 20 from one refer. This way you can earn much more free recharges from mobile cash. i am also providing an unlimited trick for mobile cash. Try it too. Now, Don't Miss any updates. Join Our Telegram Channel . Get all Tech Tweaks, Updates and latest tricks in telegram. 3. They are using missed call option for verifying your number. Sometimes they automatically verify after missed call. If they don’t. Enter the number that they called [ missed call]. You can get it from your call history. 6. You can get your refer url on invite tab. 2. signup using any other number. 3. verify the number. and try 3 apps on mobile cash. 6. And do all steps again and again….. Enjoy unlimited free recharge by mobile cash. I hope you got the trick. If you find this article helpful then please share it on facebook and other social networking sites. Subscribe to Techintor.com Via Email Address and get all tricks directly into your Email.